A quick search on the internet for Freemasonry produces many images of the society and the very interesting photos that I present here, though small in size and copyrighted, reveal a historical insight into the Craft during the 19th and early 20th centuries. This first photo is a wonderfully historic image, it dates from c.1855 – 1865 and the image itself is from a photograph by David Bohl, and is currently owned by the National Heritage Museum. 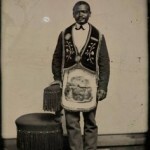 It reveals an African-American Mason, dressed in a wide-brimmed hat and typical dress of the period for a gentleman; dark suit, necktie, and of course a decorated Masonic apron and what is described as an Oddfellows sash. The photo was used in Mark Tabbert’s American Freemasons and it is put forward in its accompanying caption that the subject may be a Prince Hall Mason. This second photo can be found on various websites across the internet so copyright cannot be established, but it reveals another insight into fraternal orders amongst the black community. It cannot be dated precisely, but an estimate of late 19th/early 20th century can be given. It is a very striking historical photograph, the subject looking very distinguished in the Masonic/other fraternal order regalia. The third photo can be seen on various internet sites and has popped up on social media a number of times, so copyright cannot be ascertained for certain, but this particular image is indicated as belonging to John Miller images. However, the image also appears in Mark Tabbert’s American Freemasons giving reference to the National Heritage Museum. It reveals three gentlemen, two with Masonic-like regalia, looking very distinguished, the style of their dress providing a date of the 1850s-1860s, a style common with the USA. I like this photo as it shows the three friends together, the one on the left without Masonic regalia, and without knowing the story behind the photograph, your imagination can fill in the gaps; where they friends celebrating a lodge meeting? Where they about to go off to war? All three photographs I find fascinating, and if anyone has any information on either of them, I would be glad to hear from you.